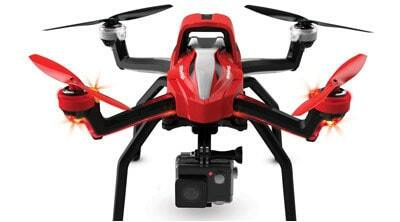 If you haven’t read our top lists of drones under $100, or drones under $200, click the links. 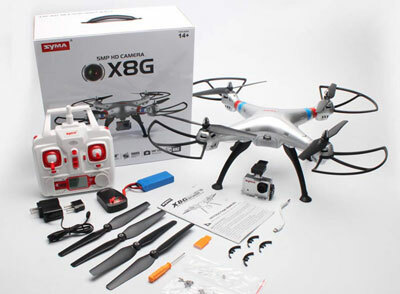 The higher your budget, the best are the features and specifications of the quadcopters you are able to acquire. All the 10 quadcopters under $300 are amazing machines, not the average low-cost quad. 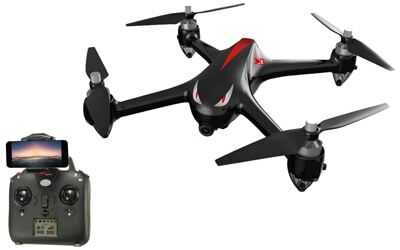 Altair AA108 is a toy-grade drone, there is no doubt about it… but despite that, it is still worthy of this list thanks to great build quality and top of the line toy-grade performance. As long as you don’t expect premium features from it (and no sane person would, considering the dirt-cheap price tag), I’m sure Altair AA108 will surprise you with its charm. When it comes to the features’ side of the deal, this little birdie has a lot to brag about. For instance, it sports Altitude Hold, Custom Flight Routes as well as 3 flying modes (beginner, intermediate and expert), all of which contribute to an overall amazing flying experience. But, more important than its features – Altair AA108 bears a miniature imaging sensor. Yes, this little fella sports a tiny camera. And it’s not one of those petty VGA ones – you are looking at a micro sensor capable of recording in 720p. With that being said, both images and videos look pretty good so it’s safe to say Altair AA108 brings good value for money in terms of camera and features. Specifications of this birdie are pretty straightforward. There isn’t that many oscillations when compared to other similarly priced models. More precisely, airtime goes around the 10-minute mark which is a standard. However, you will be happy to know that Altair AA108 comes with an extra battery meaning you get access up to 20 minutes of flying per session. And during that time your drone will allow you to reach 100 meters away from the provided controller. It’s not a lot, I know… but go ahead and find a cheaper model with longer operating range… That’s right, you can’t! Drones have burst onto the mainstream market through features on major social media channels which led to an explosion of their popularity. That’s exactly how Zerotech Dobby went with its marketing campaign – a lot of popular YouTubers and Vloggers have opted for reviews and sparked the interest of a much wider audience. But, is all this Zerotech Dobby hype valid or is it just a mere hype train that’s going to swing us by? Well, I guess we have to take a closer look at it and see what does it bring to the table! First off, let’s talk about the hardware this little fella possesses… and trust me, this is some serious firepower. The base of Zerotech Dobby’s functionalities is a Qualcomm Snapdragon SOC with 2GB RAM and 2.3GHz Quad-Core Processor. 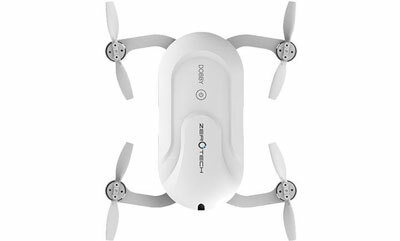 In terms of features, Zerotech Dobby incorporates dual navigation (GPS and GLONASS) as well as several supporting autonomous flight features. The queen jewel here is definitely its sophisticated facial recognition software which will do you a world of good once you get used to it. Furthermore, Zerotech Dobby uses Adreno 330 as its graphics processor and sports a miniature 13MPX camera. Talking about camera, you should know that it possesses Electronic Image Stabilization and can record in crystal clear 4K resolution. However, you cannot combine EIS with 4K – it works with resolutions up to FHD. Still, EIS FHD footage looks absolutely brilliant. Plus, considering the fact majority of PC users worldwide are still using FHD monitors, I consider 4K to be an overkill for casuals. 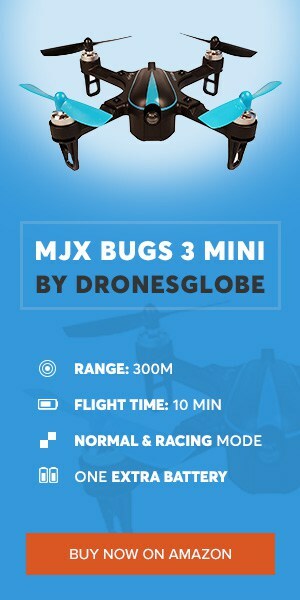 MJX Bugs 3 is the cheapest drone on this list, at least at the time of writing this article. With that being said, obviously the best thing about it is the fact it offers great value for money. As a matter of fact, MJX Bugs 3 is cheapest drone with brushless motors currently available on the market… And trust me, brushless motors do make a difference! In terms of build quality, I’d say things are looking pretty good; significantly better than what we used to see in this price range. I hope this is way other drones in 2018 will follow. Great value for the quality… even more so if you have GoPro or any other action camera, since MJX Bugs 3 comes with gimbal that supports GoPro cameras. It’s not a secret that UDI’s toy-grade drones are subjects to plenty of rebranding and incremental modifications. This is true for their U818 model which has received a lot of positive feedback from customers all over the world. 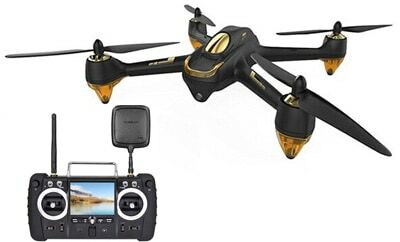 But, we will be focusing on U818Plus edition which brings forth several awesome improvements that make this little birdie stand out from other low-end drones. What exactly is so special about it? Well, there’s only one way to find out and that’s by reading the next couple of paragraphs! 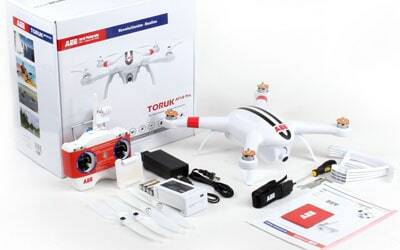 Let’s face it – for roughly $150 you cannot really expect that much of a drone. Still, the boundaries are being heavily pushed during the last few years and we are seeing massive price cuts in the industry. This has led to more firepower for cheaper models and that’s exactly what UDI U818Plus has to offer. Take its camera for example – we are talking about a solid 2MPX sensor which can record in HD. A couple of years back, you couldn’t even get such a camera for $150 not to mention a freaking drone on top of it. Lately we’ve been seeing a lot of cheap low-end drones equipped with Altitude Hold and other similar smart flight features. But how is this possible when they don’t possess GPS? Well, these quasy-smart features (at least that’s how I love to call them) aren’t using GPS but other, less expensive sensors. They do their job with no issues but the precision is, needless to say, lacking. Same can be said about UDI U818Plus – it’s not a smart drone but still provides a portion of smart-drone feature set. Specifications-wise, there is no doubt UDI did a great job with U818Plus. Starting off with flight duration, this thing can fly around for approximately 12 minutes which is not to be taken for granted at this price point. Furthermore, operating range perhaps isn’t as long as, f.e. MJX Bugs 2W, but it’s still admirable. It clocks in at roughly 150 meters which should satisfy the majority of its potential buyers. If you love drones that come with camera mounts for mounting your favorite action cameras, then this one is a no brainer. As the title suggest, I am talking about F100 by Force1, a relatively new drone that has gotten a lot of praise. Partially due to a sturdy build and partially because of its brushless motors. So, what I am basically trying to tell you here is that Force1 F100 makes for a great entry-level aerial photography platform for people who already own an action camera. If you are one of them, what are you waiting for? First off, Force1 F100 is one of those “cameraless drones”. It’s true – this little fella doesn’t come with a camera meaning you either have to provide your own or keep using it without one. End of story. If you decide to provide your own, you will be happy to know it comes with a dedicated mount for GoPro’s and other action camera brands. So yeah, even though it doesn’t come with a camera, mounting one is as easy as it gets! On the other hand, features are actually the biggest downside of this one. Well not exactly features but the obvious lack of them. As far as they are concerned, Force1 F100 only has access to 2 different speed modes, one key flips and tricks and that’s pretty much it. However, when it comes to the specifications… well that’s where this little birdie shines the most! Where should we start off with this section? Well, perhaps I can do F100 some justice by stating that it sports powerful brushless motors. For those of you unfamiliar with drone world nomenclature – brushless motors deliver better power efficiency and last much longer than brushed ones. On top of that, Force1 F100 can go around 250 meters away from its controller. Flight time is no pushover either – you can expect somewhere between 10 and 15 minutes of flight time, depending on whether or not you’re using an action camera with it. So, with all this laid out, I’m sure you’ll all agree with me when I say that this little birdie is an absolute champ and well worth the price it goes for. Drone that used to cost more than $800 (in 2016) can now be bought for less than $300. It probably means that 3DR is getting ready to launch a new drone soon, so they are giving “old” one at discounted price to prepare market for a new model. If that’s not it – then perhaps they’re pivoting to a completely new area and need quick funds for research and development. So, if you ask me, now is a great time to buy this drone. People often call it “smart drone” because of a wide array features it has at its disposal. 3DR Solo has 1GHz processor that will make sure all data is processed without lag. Furthermore, 3DR Solo also has all modern features such as follow me mode, cable camera, orbit and selfie. All features work very well. Moving forward, thanks to GPS, 3DR Solo features auto return to home function too. In case you go out of range (500 meters), 3DR Solo will automatically return back to take off point. When it comes to flight time, you can expect somewhere between 18 and 22 minutes. 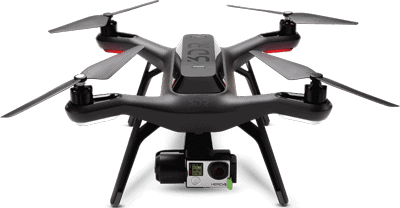 3DR Solo comes with GoPro (HERO 3+ and 4) gimbal. Interesting thing is that transmitter has HDMI out port, which means you can stream live feed from camera on pretty much any device that supports HDMI input. Cool, right? Traxxas is USA based company well known for their RC cars. They have many years of experience in manufacturing RC toys so it was question of time when they’ll jump in drones’ industry. Traxxas Aton is one of their first drones, and trust me, it’s worth your attention. Believe it or not, Traxxas Aton has some of the best flight capabilities I’ve ever seen. It’s much faster and agile when compared to other high-end drones, such a Phantom 3 for an example. 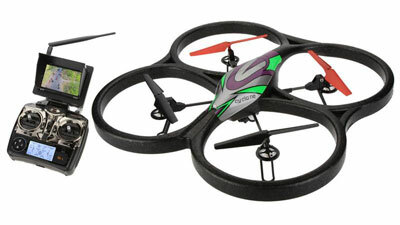 It has 2 main flying modes, Sport and Film. In Sport mode, it can reach 50mph of top speed, while in Film mode it’s very stable and smooth. This particular model (under $300) doesn’t come with camera included. Luckily, you can use your own action camera since this little birdie sports a 2-axis gimbal (purchased separately or with Traxxas Aton Plus bundle). Moving forward, Traxxas Aton has strong and reliable body construction that promises a lot, it shouldn’t break after few beginners crashes. It has some interesting functions such as: dual GPS, Return to home and Air brake. 3 cell 3000mAh battery should provide you with 18 minutes of flight time. Range is software limited to 160 meters (500 feet). If you fly it out of the range, it will automatically return back to its initial takeoff location… and believe me – this will come in handy way more often than you think. Hubsan’s latest model offers us great price / value ratio. This is the first new drone that comes with many modern and advanced features for a price of less than $300. I know, there are several other advanced drones on this lists with similar price, but keep in mind that they used to cost much more. Their price reduced after new models came out (use DJI Phantom 2 as an example…). Enough about that though, let’s focus solely on Hubsan H501S and see what’s it all about! First things first – Hubsan H501S comes with brushless motors, which means they should give you more than enough power for such a lightweight drone. It also means you’ll be safe from replacing them for a fair amount of time. Furthermore, this little birdie comes with an outstanding 1080p built-in camera. Both video and photo quality of it is bound to amaze you. Likewise, it also features 5.8GHz FPV and there’s even a dedicated 4.3” LCD screen on transmitter. These are some of the function H501S comes with: GPS, headless mode, automatic return, altitude hold mode and follow me. Last but not least, let’s talk a bit about Hubsan H501S specifications. When it comes to flight time, you should expect something about 16-18 minutes, which is solid result. And finally, advertised control range is 400 meters but don’t be too optimistic – in most cases you’ll get around 350m. 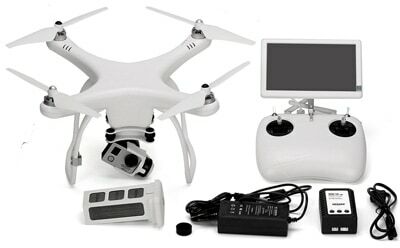 When I first saw UPair drone, I was very excited to get it for review. I didn’t order it right away, instead I waited for first buyer reviews on amazon. When I saw positive reviews, I knew it was time to get one for myself. I can tell you, this drone is great alternative to high-end models if you’re low on budget. Come to think of it, it’s basically a copy of DJI Phantom models… But with a few aces up its sleeves. UpAir One comes with everything you need, including a dedicated 2K camera! As a matter of fact, you can even pay extra $50 and get yourself an upgraded 4K camera that captures brilliant videos. Furthermore, this little birdie has FPV, transmitter which looks similar to DJI ones. Plus, it comes with a built-in 7” LCD screen. Live feed from camera is transmitted through 5.8GHz frequency, which should provide you decent image quality. Much better than you’d experience with WiFi based FPV. On average, people are getting around 16 minutes of flight time, which is solid result if you ask me. Control range is somewhere around 500 meters. UpAir does have GPS which is always a big plus. Another positive thing is UpAir is fulfilled by Amazon, which means you can get it shipped by Prime service + you can easily return it if any unexpected problems occur. Finally, we have reached the best drone under $300 currently available on the market. It is none other than the spiritual success of late Bugs 3 – Bugs 2W! 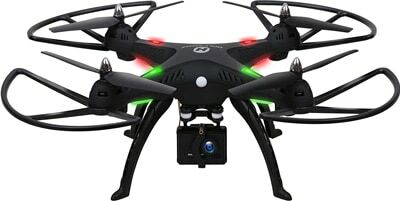 It sports a much smaller form factor and actually comes with a built-in camera which is a massive sales pitch for people looking to get into aerial photography. Furthermore, it needs to be said that we are talking about a smart drone (more on that later) with a whole bunch of additional functionalities you’d come to expect from higher end models. So, why don’t we start from that and see what’s MJX Bugs 2W all about! As far as the camera is concerned, I already gave you the assumption that it’s a good one. Well, more precisely, we are talking about what seems to be a 5MPX sensor capable of recording in Full HD. It is a lot better than those standard 2MPX sensors which are overflowing the entry level market. Image quality is good but you might experience a bit of jello in windy weather. Features-wise, MJX Bugs 2W is actually a smart drone due to its integrated GPS module. This brings forth several handy features including Return To Home and Altitude Hold. Needless to say, the latter will prove to be of great help for recording smooth and cinematic aerial footage. Lastly, the controller seems good too. It fits nicely in hands and provides intuitive yet responsive controls. Believe it or not, MJX Bugs 2W is an absolute beast in terms of specifications. With up to 1000 meters of operating range (that’s what’s written on the spec sheet although I only went slightly over 500m) and approximately 18 minutes of flight time, there aren’t that many similarly priced models with such awesome specifications. As a matter of fact, I don’t believe there is a single one. So, with that in mind, there is no doubt in the sheer quality of MJX Bugs 2W. It is a worthy successor to Bugs 3 and with everything it has to offer, it is just a matter of time before it reaches the top of the entry level food chain. What can you expect from drones under $300? When it comes to camera quality, you cannot really expect 1080p footage and hardware image stabilization on every single model. Come to think of it, a couple of drones listed below don’t even come with a camera. Still, that doesn’t make them obsolete. MJX Bugs 3, for example, doesn’t come with a camera but sports amount that fits lots of models. On the other hand, with models that do come with cameras, you’ll most likely be looking at 720p or 1080p footage and a mediocre CMOS sensor. Battery life, however, is a completely different story. While premium models have roughly 22 to 27 minutes of airtime, these little fellas can do up to 20… in most cases. To be more precise, they can fly around for roughly 15 to 20 minutes. There are some exceptions though, but more on that in their descriptions later on. In terms of range, you should look for at least 300 meters. There are certain models which go as far as 500 or even more, but they’re usually bordering on the price range. Anything less than 300 is a no-go for me. Even though some of you might be fine with such a distance, I personally enjoy exploring the area with my FPV goggles on. You’d be surprised at how many drones don’t come with GPS or other essential features such as altitude hold and return to home. Still, there are a few who are well worth checking out. Even though RTH, AH and GPS might seem irrelevant to some of you, they give a much better flying experience. That’s why I warmly recommend you getting a drone that has them. What are these drones good for? Drones featured in the list below can serve a lot of uses, it all depends on your creativity and imagination. One thing is for sure – they make excellent flying trainers! If you’re a beginner or a first-time flyer, not only will you have fun with them no matter what, but you will also feel worry-free while doing so… Because, even if you happen to crash it, it wasn’t much of an investment. On the other hand, if you crashed a $1000 drone, you’d be on your way to Sadifornia in a matter of seconds. As we already mentioned above, entry level drones are great for practice. They provide a worry-free experience and are great for your first “steps” into piloting. With them, you’ll be able to learn all the basics and prepare yourself for some high end drone. After you’ve mastered your first steps, you’ll be flying like a real champ and having lots of fun with your new toy. It’s true! Every single one of below listed drones are insanely fun to casually fly around. They provide responsive controls, one key flips, and possess a fair dose of flight stability. A big portion of drones that are listed below are somewhat good when it comes to aerial photography. Take 3DR Solo as an example. It’s stable and provides a dedicated 3-axis gimbal which works seamlessly with GoPro Hero cameras. What more do you need to make the perfect shot? Range? Check! Battery duration? Check! 10th position on our list of top 10 drones under $300 is reserved for one of the best mid priced drones – Parrot AR 2.0. It might not be the best drone out there, but with a fair price and a huge amount of satisfied users, it’s more than worth checking a shot! But, what are its users so satisfied for? Well, specifications aren’t the reason, that’s for sure! You see, Parrot AR 2.0 works via WiFi so it can only reach up to 50 meters (in ideal conditions when there is no WiFi interference going on in the area) and fly around for up to 10 minutes. But, what it does offer is extremely responsible control and a whole lot of fun, especially for children. As a bonus, it sports an OK HD (720p if we are to be more precise here) camera that has an adjustable angle as an extra form of customizability. Generally speaking, the build quality is great and you can expect Parrot AR 2.0 to survive a fair share of beatings and crashes. Not only because of its prop guards but because of a strong casing that’s shock resistant. As I’ve already mentioned above, Parrot AR 2.0 is a model that’s mostly suitable for children. It’s great for taking your very first step into drone piloting and as such – I warmly recommend it ! 9th spot on my list goes to one of Holy Stone’s entry level models. It might not be as popular as the Predator HS170C, but HS300 still performs (and looks) absolutely great. I, personally, am a big fan of its design. All-black body with bright sets of LEDs (the usual color combination – red and green) is my fetish, some would say. But, other than that, does Holy Stone HS300 have anything else to offer? Let’s dig deeper and we might just find out! First of all, it needs to be said that Holy Stone HS300 has an incredibly good camera for its price. This is a FHD 120-degree wide angle camera which has its own little anti vibration mount for extra image stability. And talking about stability, it’s noteworthy to add Holy Stone HS300 is actually a very stable (read easy to fly) drone. I was struck with surprise when I first started flying it around since I did not expect an easy task. Furthermore, even though Holy Stone HS300 does not have GPS, it actually sports the basic versions of altitude hold and one key return. Needless to say, both of these features are still handy, even though they might not be as precise and reliable as their GPS-powered counterparts. Last but not least, specifications! Holy Stone HS300 isn’t exactly the best in terms of range. You’re only getting about 150 meters. Even though I said you shouldn’t go for anything below $300 in this price range, it’s OK to make an exception for HS300 since it’s not an explorer but an amateur aerial photography platform. Battery life, on the other hand, goes anywhere from 10 to 15 minutes which is not half bad. All in all, if you want something cheap that can still provide you with excellent aerial videos and photos, you won’t find better value for money than Holy Stone HS300! Parrot Bebop was a major success. It’s not a couple of years old. Most of you probably know that it’s been replaced with an upgraded Bebop 2 version. That version, combined with Sky Controller, delivered exceptional performance against which Parrot Bebop (original) doesn’t have a chance. But, the price difference is an important factor… And so is value for money. How does Parrot Bebop 2 compare against its successor in those deparments? Let’s find out! When it comes to camera quality, things are looking great for the old champ. It features a 14MPX sensor capable of recording full HD footage. We’re talking about a very wide field of view, 180-degrees to be more precise. While this allows an incredibly large viewing space, it also causes distortion which some people won’t like at all. Features-wise, Parrot Bebop has GPS, flight map control (similar to waypoints), return to home and cloud storage where you’ll keep all your flight data. Specifications, on the other hand, are obviously the main upgrade which Parrot Bebop 2 received. With that said, the original version falls short with only cca 10 minutes of flight time (Bebop 2 has 25) and 200-250 meters of operating range. True, you can always kick things up a notch and go for the Sky Controller which is bound to significantly boost your range. All things considered, Parrot Bebop still seems like a viable drone for casual use. Even though its successor is making a fortune, the original Parrot Bebop strikes back with charm, solid performance and much lower price tag! Xiro Xplorer comes in several different versions (without camera, with camera, with GoPro gimbal). In this article, we’re referring to the version that lacks both camera and gimbal. A barebone system, if you please. When launched, XIRO gained a lot of media exposure thanks to its futuristic design. It’s still one of the best-looking drones available on the market. But, as we all know, design is not only that matters when buying a drone. Luckily, things are looking good for this little birdie outside the design department. Partically because Xiro Xplorer comes with a 5200 mAh LiPo battery that should provide you with 22-25 minutes of flight time. When it comes to stability, you’re up for a smooth, stable flight and a fair amount of wind resistance. Don’t expect to fly it during heavy storms though… It won’t be able to handle the situation. Thanks to its modular design, you can easily upgrade it with Xiro’s official Full HD camera. When it comes to control range, you can expect somewhere around 500 meters. Last but not least – Only few drones left in stock so hurry up if you think XIRO Xplorer is a worthy match for you. If you ask me – it sure is! 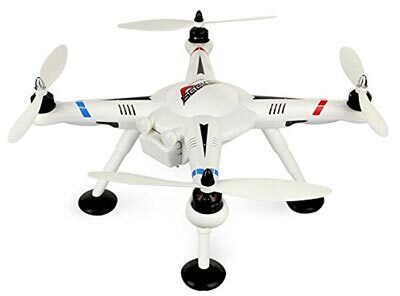 AEE is drone manufacturer well known for their high quality yet affordable drones. Even though they don’t enjoy the same amount of popularity as the likes of DJI and Yuneec, AEE is still a respectable name in the industry. That’s why it comes as no surprise to see their AP10 has everything you need to start with flying drones and learning basics of aerial photography and videography. Since AEE AP10 comes with 16MP (1080p, 60FPS) camera, aerial photography shouldn’t be an issue. It is also noteworthy to add that AP10 uses WiFi protocol for FPV transmission which means you can use your smartphone as a live video feed receiver. Furthermore, it comes with a flight range of 500 meters, while FPV range should be somewhere around 100-150 meters. Features are where this little birdie shines the most. In addition to GPS, AEE AP10 also incorporates return to home and autonomous flight, both of which will come in handy more often than you think. In terms of battery, you are looking at what seems to be a 5300 mAh LiPo battery. So, for airtime you can expect somewhere around 22-25 minutes. Last but not least, AEE is also producing and selling spare parts (propellers, batteries, camera) on Amazon, so it shouldn’t be a problem to repair those parts if you crash it. All in all, for under $300, I believe AEE AP10 is a great package and will surely provide you with plenty of fun! Remember WLtoys V666? Well, there is an upgraded version of it already out there available in the market. The V666N, one of the mid priced drones every beginner will want to have. Why? Well, the motors and propellers are covered by a protective frame which will absorb almost any impact. It is a smooth and gentle flier capable of FPV (First Person View) flight. Camera is 2MP and records at 30fps and live video is transmitted directly to the FPV screen on the RC controller. V666N includes features such as a barometer sensor and one-key automatic taking off and landing. Has a decent control range of 150 meters. We’re starting our list of top 10 drones under $300 with Syma’s most recent product. It comes with its own version of a Go Pro and it only works on X8G it is not a standalone camera. 8MP camera with 1080p of resolution protected by a mount case also designed by Syma. This case will ensure your camera is safe for the most radical of flights. The advantage form this camera to a Go Pro is you can control it through the remote. Distance range is around 100 meters, which is not that good, this is due to the camera using X8G 7.4V 2000mAh battery to power itself. This one is definitely high quality, but still very affordable product. 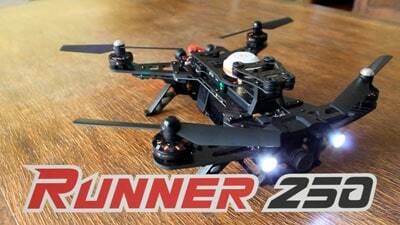 Definitely, this is one of the best quadcopters for less than $250. Runner 250 is Walkera’s racing drone, made out of carbon is extremely light and resistant, it won’t break even when hitting a tree. It uses four WK-WS-28-014 brushless motors giving him the power to fly between 35-40km/h and 12-14 minutes flight time on a range of 1KM. It is very accurate and sensitive to control. 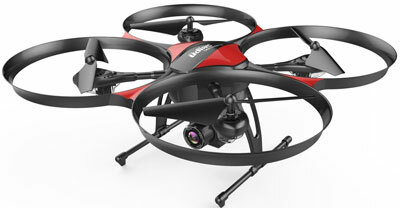 Has a built-in support for FPV camera which can be connected to Goggle 2 for real-time image transmission plus live flight data. It is not RTF (ready to fly) you have to assemble it, but there are many videos on internet explaining it and it comes with a manual, it won’t be a problem. Do you think this is the best mid priced drone? Since WLtoys is well known for their toy grade drones, I was very excited to test their first hobby grade quadcopter. Right out of the box, V303 is very, very easy to fly. Even kid could fly it. They have limited maximum range and altitude by software. It’s limited to 100 meters. I saw forum posts where people claim they modified it and it can reach up to 500 meters without problems but I wouldn’t recommend doing that if you’re beginner. 100 meters is not little, you can easily lose orientation on that distance. If you fly it out of the range, don’t worry because V303 will automatically come back. You’ll know when that happens because it will hold its position in air for 2-3 seconds, turn on red LED light and then fly back to you. Speaking of the air time, I’ve been getting around 16-18 minutes. 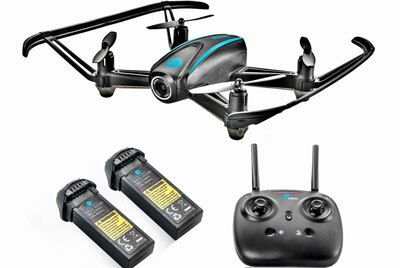 Which is very good result for a drone in this price range. Another good thing is V303 comes with built in FPV module so you’ll be able to receive live camera feed from separately bought GoPro camera. Yes, V303 supports GoPro camera. Build quality is close to high-end drones, everything holds its place and drone looks very solid. Definitely worth the money. Is this that the one called 10 is the best or a countdown to number 1 best drone under £300?? reached beyond 700m and rth back witH no problem every time. Climb to max height of 495m and hovers rock solid above there and rth back swiftly with great accuracy to home point every time. With its powerfull 1800kv brushless motor and dual gps system, you will have no confident issue with this drone onced it is up there.